RC Real Estate Group prides itself on 100% customer satisfaction. We know our business thrives when you, our customer, is satisfied with the service we provide. We have developed a team of professional, knowledgeable, and friendly staff, each with their own high level of expertise in all areas of property management in order to provide you with the highest level of customer service. Years of experience in our local market provides us the knowledge that we need to ensure you are getting the highest income possible for your investment property. As an added bonus, our reliable and loyal vendors offer tremendous savings to our company which we always pass along to you, our customer, thus increasing your investments bottom line. As a home owner, you know how important it is to keep up with the maintenance of your property in order to maintain and hopefully increase its value. Investment property is no exception. We will prepare a customized maintenance plan for your property and execute your approved maintenance plan with qualified vendors to ensure as much cost savings as possible. With this comes less risk of unexpected repairs and ensures that your property maintains or even increases in value. 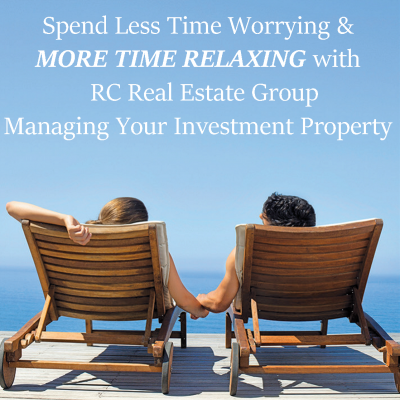 RC Real Estate Group has a team of professionals whose business thrives on marketing. Utilizing that competitive edge marketing experience, we will advertise your property for rent in all the appropriate areas. We utilize the most reputable and result driven advertising outlets via the web and other advertising venues. We also have a referral program which builds incentive for other real estate professionals to provide referrals to any of our vacant rentals. When it comes to tenants, we insist on the two “Q’s,” Qualified and Quality. We conduct a thorough screening of each potential tenant which includes a full multi-state criminal background, credit check and rental history report to ensure you have a quality tenant who should not only take care of your property, but pay their rent in a timely manner. At the end of the day, when your property is occupied, you make money. We strive to keep a low vacancy rate for all of our customers’ properties. With this comes planning. We make sure that as one tenant gives notice, we are looking for a new quality and qualified tenant utilizing our comprehensive marketing program. The RC Real Estate Group offers several levels of service because we know that every property owner is different. We’ve customized each service option with those differences in mind. Get your key to hassle free property management by choosing one of our professional service options. Click here to see our full list of services.